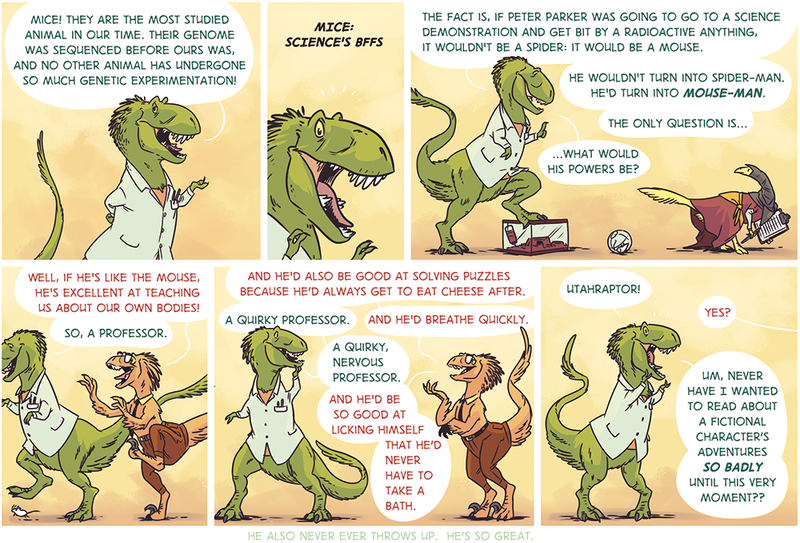 Dinosaur Comics - October 12th, 2015 - awesome fun times! October 12th, 2015: This weekend (October 17th-18th) I'll be at MICE: the Massachusetts Independent Comics Expo! It's totally free, totally great, and if you're anywhere around Cambridge, you should come. This comic is by Braden Lamb who is a great guy I've collaborated with a ton in the past. We did the Adventure Time comics (with Shelli Paroline!) and the three of us also did a comic called The Midas Flesh, from which you might recognize that very Cooper-ish utahraptor! One year ago today: once upon a time writing was actually super easy! !